Today's Halloween customs are thought to have been influenced by folk customs and beliefs from the Celtic-speaking countries, some of which are believed to have pagan roots. Jack Santino, a folklorist, writes that "there was throughout Ireland an uneasy truce existing between customs and beliefs associated with Christianity and those associated with religions that were Irish before Christianity arrived". Historian Nicholas Rogers, exploring the origins of Halloween, notes that while "some folklorists have detected its origins in the Roman feast of Pomona, the goddess of fruits and seeds, or in the festival of the dead called Parentalia, it is more typically linked to the Celtic festival of Samhain, which comes from the Old Irish for "summer's end". Samhain (pronounced SAH-win or SOW-in) was the first and most important of the four quarter days in the medieval Gaelic calendar and was celebrated on 31 October–1 November in Ireland, Scotland and the Isle of Man. A kindred festival was held at the same time of year by the Brittonic Celts, called Calan Gaeaf in Wales, Kalan Gwav in Cornwall and Kalan Goañv in Brittany; a name meaning "first day of winter". For the Celts, the day ended and began at sunset; thus the festival began on the evening before 1 November by modern reckoning. Samhain and Calan Gaeaf are mentioned in some of the earliest Irish and Welsh literature. 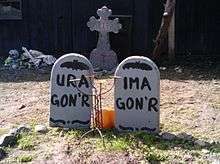 The names have been used by historians to refer to Celtic Halloween customs up until the 19th century, and are still the Gaelic and Welsh names for Halloween. Samhain/Calan Gaeaf marked the end of the harvest season and beginning of winter or the 'darker half' of the year. Like Beltane/Calan Mai, it was seen as a liminal time, when the boundary between this world and the Otherworld thinned. This meant the Aos Sí (pronounced ees shee), the 'spirits' or 'fairies', could more easily come into our world and were particularly active. Most scholars see the Aos Sí as "degraded versions of ancient gods [...] whose power remained active in the people's minds even after they had been officially replaced by later religious beliefs". The Aos Sí were both respected and feared, with individuals often invoking the protection of God when approaching their dwellings. At Samhain, it was believed that the Aos Sí needed to be propitiated to ensure that the people and their livestock survived the winter. Offerings of food and drink, or portions of the crops, were left outside for the Aos Sí. The souls of the dead were also said to revisit their homes seeking hospitality. Places were set at the dinner table and by the fire to welcome them. The belief that the souls of the dead return home on one night of the year and must be appeased seems to have ancient origins and is found in many cultures throughout the world. In 19th century Ireland, "candles would be lit and prayers formally offered for the souls of the dead. After this the eating, drinking, and games would begin". Throughout Ireland and Britain, the household festivities included rituals and games intended to foretell one's future, especially regarding death and marriage. Apples and nuts were often used in these divination rituals. They included apple bobbing, nut roasting, scrying or mirror-gazing, pouring molten lead or egg whites into water, dream interpretation, and others. Special bonfires were lit and there were rituals involving them. Their flames, smoke and ashes were deemed to have protective and cleansing powers, and were also used for divination. In some places, torches lit from the bonfire were carried sunwise around homes and fields to protect them. It is suggested that the fires were a kind of imitative or sympathetic magic – they mimicked the Sun, helping the "powers of growth" and holding back the decay and darkness of winter. In Scotland, these bonfires and divination games were banned by the church elders in some parishes. Later, these bonfires served to keep "away the devil". From at least the 16th century, the festival included mumming and guising in Ireland, Scotland, the Isle of Man and Wales. This involved people going house-to-house in costume (or in disguise), usually reciting verses or songs in exchange for food. It may have originally been a tradition whereby people impersonated the Aos Sí, or the souls of the dead, and received offerings on their behalf, similar to the custom of souling (see below). Impersonating these beings, or wearing a disguise, was also believed to protect oneself from them. It is suggested that the mummers and guisers "personify the old spirits of the winter, who demanded reward in exchange for good fortune". In parts of southern Ireland, the guisers included a hobby horse. A man dressed as a Láir Bhán (white mare) led youths house-to-house reciting verses—some of which had pagan overtones—in exchange for food. If the household donated food it could expect good fortune from the 'Muck Olla'; not doing so would bring misfortune. In Scotland, youths went house-to-house with masked, painted or blackened faces, often threatening to do mischief if they were not welcomed. F. Marian McNeill suggests the ancient festival included people in costume representing the spirits, and that faces were marked (or blackened) with ashes taken from the sacred bonfire. In parts of Wales, men went about dressed as fearsome beings called gwrachod. In the late 19th and early 20th century, young people in Glamorgan and Orkney cross-dressed. Elsewhere in Europe, mumming and hobby horses were part of other yearly festivals. However, in the Celtic-speaking regions they were "particularly appropriate to a night upon which supernatural beings were said to be abroad and could be imitated or warded off by human wanderers". From at least the 18th century, "imitating malignant spirits" led to playing pranks in Ireland and the Scottish Highlands. Wearing costumes and playing pranks at Halloween spread to England in the 20th century. 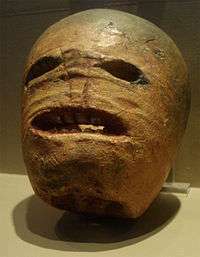 Traditionally, pranksters used hollowed out turnips or mangel wurzels often carved with grotesque faces as lanterns. By those who made them, the lanterns were variously said to represent the spirits, or were used to ward off evil spirits. 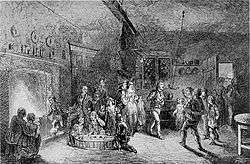 They were common in parts of Ireland and the Scottish Highlands in the 19th century, as well as in Somerset (see Punkie Night). In the 20th century they spread to other parts of England and became generally known as jack-o'-lanterns. 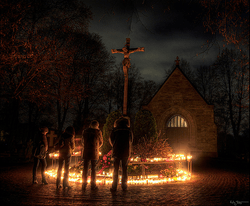 On All Hallows' Eve, Christians in some parts of the world visit cemeteries to pray and place flowers and candles on the graves of their loved ones. Top photograph shows Bangladeshi Christians lighting candles on the headstone, while bottom photograph shows Lutheran Christians praying and lighting candles in front of the crucifix. By the end of the 12th century they had become holy days of obligation across Europe and involved such traditions as ringing church bells for the souls in purgatory. In addition, "it was customary for criers dressed in black to parade the streets, ringing a bell of mournful sound and calling on all good Christians to remember the poor souls." "Souling", the custom of baking and sharing soul cakes for all christened souls, has been suggested as the origin of trick-or-treating. The custom dates back at least as far as the 15th century and was found in parts of England, Flanders, Germany and Austria. Groups of poor people, often children, would go door-to-door during Allhallowtide, collecting soul cakes, in exchange for praying for the dead, especially the souls of the givers' friends and relatives. Soul cakes would also be offered for the souls themselves to eat, or the 'soulers' would act as their representatives. As with the Lenten tradition of hot cross buns, Allhallowtide soul cakes were often marked with a cross, indicating that they were baked as alms. Shakespeare mentions souling in his comedy The Two Gentlemen of Verona (1593). On the custom of wearing costumes, Christian minister Prince Sorie Conteh wrote: "It was traditionally believed that the souls of the departed wandered the earth until All Saints' Day, and All Hallows' Eve provided one last chance for the dead to gain vengeance on their enemies before moving to the next world. In order to avoid being recognized by any soul that might be seeking such vengeance, people would don masks or costumes to disguise their identities". It is claimed that, in the Middle Ages, churches that were too poor to display the relics of martyred saints at Allhallowtide let parishioners dress up as saints instead. Some Christians observe this custom at Halloween today. Lesley Bannatyne believes this could have been a Christianization of an earlier pagan custom. It has been suggested that the carved jack-o'-lantern, a popular symbol of Halloween, originally represented the souls of the dead. On Halloween, in medieval Europe, "fires [were] lit to guide these souls on their way and deflect them from haunting honest Christian folk." Households in Austria, England and Ireland often had "candles burning in every room to guide the souls back to visit their earthly homes". These were known as "soul lights". Many Christians in mainland Europe, especially in France, believed "that once a year, on Hallowe'en, the dead of the churchyards rose for one wild, hideous carnival" known as the danse macabre, which has often been depicted in church decoration. Christopher Allmand and Rosamond McKitterick write in The New Cambridge Medieval History that "Christians were moved by the sight of the Infant Jesus playing on his mother's knee; their hearts were touched by the Pietà; and patron saints reassured them by their presence. But, all the while, the danse macabre urged them not to forget the end of all earthly things." An article published by Christianity Today claimed that the danse macabre was enacted at village pageants and at court masques, with people "dressing up as corpses from various strata of society", and suggested this was the origin of modern-day Halloween costume parties. 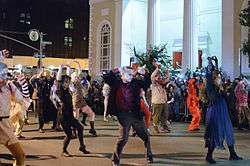 The annual Greenwich Village Halloween Parade in New York City is the world's largest Halloween parade. The modern imagery of Halloween comes from many sources, including Christian eschatology, national customs, works of Gothic and horror literature (such as the novels Frankenstein and Dracula) and classic horror films (such as Frankenstein and The Mummy). Imagery of the skull, a reference to Golgotha in the Christian tradition, serves as "a reminder of death and the transitory quality of human life" and is consequently found in memento mori and vanitas compositions; skulls have therefore been commonplace in Halloween, which touches on this theme. Traditionally, the back walls of churches are "decorated with a depiction of the Last Judgment, complete with graves opening and the dead rising, with a heaven filled with angels and a hell filled with devils", a motif that has permeated the observance of this triduum. One of the earliest works on the subject of Halloween is from Scottish poet John Mayne, who, in 1780, made note of pranks at Halloween; "What fearfu' pranks ensue! ", as well as the supernatural associated with the night, "Bogies" (ghosts), influencing Robert Burns' "Halloween" (1785). 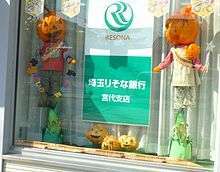 Elements of the autumn season, such as pumpkins, corn husks and scarecrows, are also prevalent. 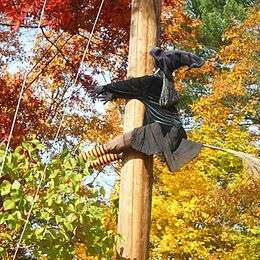 Homes are often decorated with these types of symbols around Halloween. Halloween imagery includes themes of death, evil, and mythical monsters. Black, orange, and sometimes purple are Halloween's traditional colors. 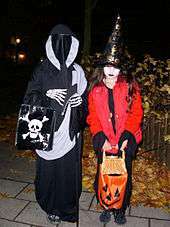 Trick-or-treating is a customary celebration for children on Halloween. Children go in costume from house to house, asking for treats such as candy or sometimes money, with the question, "Trick or treat?" The word "trick" implies a "threat" to perform mischief on the homeowners or their property if no treat is given. The practice is said to have roots in the medieval practice of mumming, which is closely related to souling. John Pymm writes that "many of the feast days associated with the presentation of mumming plays were celebrated by the Christian Church." These feast days included All Hallows' Eve, Christmas, Twelfth Night and Shrove Tuesday. Mumming, practiced in Germany, Scandinavia and other parts of Europe, involved masked persons in fancy dress who "paraded the streets and entered houses to dance or play dice in silence". In England, from the medieval period, up until the 1930s, people practiced the Christian custom of souling on Halloween, which involved groups of soulers, both Protestant and Catholic, going from parish to parish, begging the rich for soul cakes, in exchange for praying for the souls of the givers and their friends. In Scotland and Ireland, guising – children disguised in costume going from door to door for food or coins – is a traditional Halloween custom, and is recorded in Scotland at Halloween in 1895 where masqueraders in disguise carrying lanterns made out of scooped out turnips, visit homes to be rewarded with cakes, fruit and money. The practice of guising at Halloween in North America is first recorded in 1911, where a newspaper in Kingston, Ontario reported children going "guising" around the neighborhood. American historian and author Ruth Edna Kelley of Massachusetts wrote the first book length history of Halloween in the US; The Book of Hallowe'en (1919), and references souling in the chapter "Hallowe'en in America". In her book, Kelley touches on customs that arrived from across the Atlantic; "Americans have fostered them, and are making this an occasion something like what it must have been in its best days overseas. All Halloween customs in the United States are borrowed directly or adapted from those of other countries". Halloween costumes are traditionally modeled after supernatural figures such as vampires, monsters, ghosts, skeletons, witches, and devils. Over time, in the United States the costume selection extended to include popular characters from fiction, celebrities, and generic archetypes such as ninjas and princesses. The yearly New York Halloween Parade, begun in 1974 by puppeteer and mask maker Ralph Lee of Greenwich Village, is the world's largest Halloween parade and one of America's only major nighttime parades (along with Portland's Starlight Parade), attracting more than 60,000 costumed participants, two million spectators, and a worldwide television audience of over 100 million. The following activities were a common feature of Halloween in Ireland and Britain during the 17th–20th centuries. Some have become more widespread and continue to be popular today. 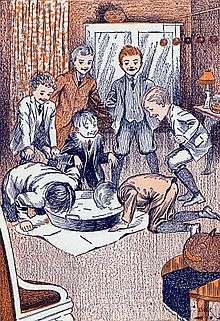 One common game is apple bobbing or dunking (which may be called "dooking" in Scotland) in which apples float in a tub or a large basin of water and the participants must use only their teeth to remove an apple from the basin. A variant of dunking involves kneeling on a chair, holding a fork between the teeth and trying to drive the fork into an apple. Another common game involves hanging up treacle or syrup-coated scones by strings; these must be eaten without using hands while they remain attached to the string, an activity that inevitably leads to a sticky face. Another once-popular game involves hanging a small wooden rod from the ceiling at head height, with a lit candle on one end and an apple hanging from the other. 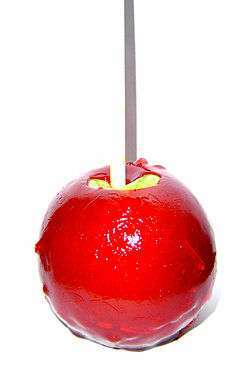 The rod is spun round and everyone takes turns to try to catch the apple with their teeth. In Ireland and Scotland, items would be hidden in food—usually a cake, barmbrack, cranachan, champ or colcannon—and portions of it served out at random. A person's future would be foretold by the item they happened to find; for example a ring meant marriage and a coin meant wealth. Haunted attractions are entertainment venues designed to thrill and scare patrons. Most attractions are seasonal Halloween businesses. The origins of these paid scare venues are difficult to pinpoint, but it is generally accepted that they were first commonly used by the Junior Chamber International (Jaycees) for fundraising. They include haunted houses, corn mazes, and hayrides, and the level of sophistication of the effects has risen as the industry has grown. Haunted attractions in the United States bring in an estimated $300–500 million each year, and draw some 400,000 customers, although press sources writing in 2005 speculated that the industry had reached its peak at that time. This maturing and growth within the industry has led to technically more advanced special effects and costuming, comparable with that of Hollywood films. In the Roman Catholic Church, Halloween's Christian connection is cited, and Halloween celebrations are common in Catholic parochial schools throughout North America and in Ireland. Many fundamentalist and evangelical churches use "Hell houses" and comic-style tracts in order to make use of Halloween's popularity as an opportunity for evangelism. Others consider Halloween to be completely incompatible with the Christian faith due to its putative origins in the Festival of the Dead celebration. Indeed, even though Eastern Orthodox Christians observe All Hallows' Day on the First Sunday after Pentecost. The Eastern Orthodox Church recommends the observance of Vespers or a Paraklesis on the Western observance of All Hallows' Eve, out of the pastoral need to provide an alternative to popular celebrations. There is no consistent rule or view on Halloween amongst those who describe themselves as Neopagans or Wiccans. Some Neopagans do not observe Halloween, but instead observe Samhain on 1 November, some neopagans do enjoy Halloween festivities, stating that one can observe both "the solemnity of Samhain in addition to the fun of Halloween". Some neopagans are opposed to the celebration of Hallowe'en, stating that it "trivializes Samhain", and "avoid Halloween, because of the interruptions from trick or treaters". The Manitoban writes that "Wiccans don’t officially celebrate Halloween, despite the fact that 31 Oct. will still have a star beside it in any good Wiccan’s day planner. Starting at sundown, Wiccans celebrate a holiday known as Samhain. Samhain actually comes from old Celtic traditions and is not exclusive to Neopagan religions like Wicca. While the traditions of this holiday originate in Celtic countries, modern day Wiccans don’t try to historically replicate Samhain celebrations. Some traditional Samhain rituals are still practised, but at its core, the period is treated as a time to celebrate darkness and the dead — a possible reason why Samhain can be confused with Halloween celebrations." The traditions and importance of Halloween vary greatly among countries that observe it. In Scotland and Ireland, traditional Halloween customs include children dressing up in costume going "guising", holding parties, while other practices in Ireland include lighting bonfires, and having firework displays. In Brittany children would play practical jokes by setting candles inside skulls in graveyards to frighten visitors. Mass transatlantic immigration in the 19th century popularized Halloween in North America, and celebration in the United States and Canada has had a significant impact on how the event is observed in other nations. This larger North American influence, particularly in iconic and commercial elements, has extended to places such as South America such as Chile, Australia, New Zealand, (most) continental Europe, Japan, and other parts of East Asia. In the Philippines, during Halloween, Filipinos return to their hometowns and purchase candles and flowers, in preparation for the following All Saints Day (Araw ng mga Patay) on 1 November and All Souls Day —though it falls on 2 November, most of them observe it on the day before. 1 2 Anne E. Kitch (2004). The Anglican Family Prayer Book. Church Publishing, Inc. Retrieved 31 October 2011. All Hallow's Eve, which later became known as Halloween, is celebrated on the night before All Saints' Day, November 1. Use this simple prayer service in conjunction with Halloween festivities to mark the Christian roots of this festival. 1 2 Merriam-Webster's Encyclopædia of World Religions. Merriam-Webster. 1999. Retrieved 31 October 2011. Halloween, also called All Hallows' Eve, holy or hallowed evening observed on October 31, the eve of All Saints' Day. The Irish pre-Christian observances influenced the Christian festival of All Hallows' Eve, celebrated on the same date. ↑ "NEDCO Producers' Guide". 31-33. Northeast Dairy Cooperative Federation. 1973. Originally celebrated as the night before All Saints' Day, Christians chose November first to honor their many saints. The night before was called All Saints' Eve or hallowed eve meaning holy evening. ↑ Hughes, Rebekkah (29 October 2014). "Happy Hallowe'en Surrey!" (PDF). The Stag. University of Surrey. p. 1. Retrieved October 31, 2015. Halloween or Hallowe'en, is the yearly celebration on October 31st that signifies the first day of Allhallowtide, being the time to remember the dead, including martyrs, saints and all faithful departed Christians. ↑ Roberts, Brian K. (1987). The Making of the English Village: A Study in Historical Geography. Longman Scientific & Technical. ISBN 9780582301436. Retrieved 14 December 2015. Time out of time', when the barriers between this world and the next were down, the dead returned from the grave, and gods and strangers from the underworld walked abroad was a twice- yearly reality, on dates Christianised as All Hallows' Eve and All Hallows' Day. ↑ Austrian information. 1965. Retrieved 31 October 2011. The feasts of Hallowe'en, or All Hallows Eve and the devotions to the dead on All Saints' and All Souls' Day are both mixtures of old Celtic, Druid and other pagan customs intertwined with Christian practice. ↑ Bolinius, Erich (31 October 2006), Halloween (in German), FDP Emden, Die lückenhaften religionsgeschichtlichen Überlieferungen, die auf die Neuzeit begrenzte historische Dimension der Halloween-Kultausprägung, vor allem auch die Halloween-Metaphorik legen nahe, daß wir umdenken müssen: Halloween geht nicht auf das heidnische Samhain zurück, sondern steht in Bezug zum christlichen Totengedenkfest Allerheiligen/ Allerseelen. ↑ Döring, Dr. Volkskundler Alois (2011). "Süßes, Saures - olle Kamellen? Ist Halloween schon wieder out?" (in German). Westdeutscher Rundfunk. Archived from the original on 2011-06-14. Retrieved 12 November 2015. Dr. Alois Döring ist wissenschaftlicher Referent für Volkskunde beim LVR-Institut für Landeskunde und Regionalgeschichte Bonn. Er schrieb zahlreiche Bücher über Bräuche im Rheinland, darunter das Nachschlagewerk "Rheinische Bräuche durch das Jahr". Darin widerspricht Döring der These, Halloween sei ursprünglich ein keltisch-heidnisches Totenfest. Vielmehr stamme Halloween von den britischen Inseln, der Begriff leite sich ab von "All Hallows eve", Abend vor Allerheiligen. Irische Einwanderer hätten das Fest nach Amerika gebracht, so Döring, von wo aus es als "amerikanischer" Brauch nach Europa zurückkehrte. ↑ "All Hallows Eve Service" (PDF). Duke University. 31 October 2012. Retrieved 31 May 2014. About All Hallows Eve: Tonight is the eve of All Saints Day, the festival in the Church that recalls the faith and witness of the men and women who have come before us. The service celebrates our continuing communion with them, and memorializes the recently deceased. 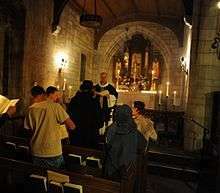 The early church followed the Jewish custom that a new day began at sundown; thus, feasts and festivals in the church were observed beginning on the night before. ↑ Kernan, Joe (October 30, 2013). "Not so spooky after all: The roots of Halloween are tamer than you think". Cranston Herald. Retrieved October 31, 2015. By the early 20th century, Halloween, like Christmas, was commercialized. Pre-made costumes, decorations and special candy all became available. The Christian origins of the holiday were downplayed. ↑ Braden, Donna R.; Village, Henry Ford Museum and Greenfield (1988). Leisure and entertainment in America. Henry Ford Museum & Greenfield Village. ISBN 9780933728325. Retrieved 2 June 2014. Halloween, a holiday with religious origins but increasingly secularized as celebrated in America, came to assume major proportions as a children's festivity. ↑ "Online Etymology Dictionary: Halloween". Etymonline.com. Retrieved 13 October 2013. 1 2 Rogers, Nicholas (2002). "Samhain and the Celtic Origins of Halloween". Halloween: From Pagan Ritual to Party Night, pp. 11–21. New York: Oxford Univ. Press. ISBN 0-19-516896-8. ↑ Monaghan, Patricia (2009-01-01). The Encyclopedia of Celtic Mythology and Folklore. Infobase Publishing. p. 167. ISBN 9781438110370. Retrieved 19 October 2015. They were both respected and feared. "Their backs towards us, their faces away from us, and may God and Mary save us from harm," was a prayer spoken whenever one ventured near their dwellings. 1 2 3 Miles, Clement A. (1912). Christmas in Ritual and Tradition. Chapter 7: All Hallow Tide to Martinmas. ↑ MacCulloch, John Arnott (1911). The Religion of the Ancient Celts. Chapter 18: Festivals. ↑ Rosinsky, Natalie M. (2002-07-01). Halloween. Capstone. p. 8. ISBN 9780756503925. Christian leaders made old Celtic and Roman customs into new Christan ones. Bonfires were once lighted against evil spirits. Now, they kept away the devil. ↑ Saunders, William. "All Saints and All Souls". catholiceducation.org. Retrieved 19 September 2016. 1 2 MacCulloch, John Arnott (1911). The Religion of the Ancient Celts. Chapter 10: The Cult of the Dead. 1 2 3 4 5 "Halloween". Britannica. Encyclopædia Britannica. Retrieved 25 October 2012. ↑ Prince Sorie Conteh (2009). Traditionalists, Muslims, and Christians in Africa: Interreligious Encounters and Dialogue. Cambria Press. Retrieved 31 October 2011. ↑ Allmand, Christopher (1998-06-18). The New Cambridge Medieval History: Volume 7, C.1415-c.1500. Cambridge University Press. p. 210. ISBN 9780521382960. Retrieved 19 October 2015. ↑ Books & Culture: A Christian Review. Christianity Today. 1999. p. 12. 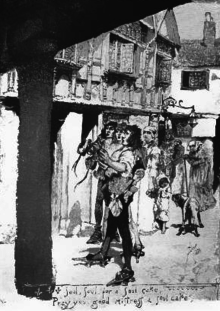 Sometimes enacted as at village pageants, the danse macabre was also performed as court masques, the courtiers dressing up as corpses from various strata of society...both the name and the observance began liturgically as All Hallows' Eve. ↑ Hörandner, Editha (2005). Halloween in der Steiermark und anderswo. LIT Verlag Münster. p. 99. ISBN 9783825888893. On the other hand the postmodern phenomenon of "antifashion" is also to be found in some Halloween costumes. Black and orange are a 'must' with many costumes. Halloween - like the medieval danse macabre - is closely connected with superstitions and it might be a way of dealing with death in a playful way. ↑ Hutton, Ronald. The Stations of the Sun: A History of the Ritual Year in Britain. Oxford University Press, 1996. page 373. Note, however, that this custom was a survival of ancient pagan practice, and was not recognized or encouraged by the Church of England. 1 2 Village Halloween Parade. "History of the Parade". Retrieved 19 September 2014. 1 2 3 Frank Leslie's popular monthly, Volume 40, November 1895, p. 540-543. Books.google.com. 5 February 2009. Retrieved 23 October 2011. ↑ As late as 1900, an article on Thanksgiving entertaining recommended a lit jack-o'-lantern as part of the festivities. "The Day We Celebrate: Thanksgiving Treated Gastronomically and Socially", The New York Times, 24 November 1895, p. 27. "Odd Ornaments for Table", The New York Times, 21 October 1900, p. 12. ↑ Kelley, Ruth Edna. The Book of Hallowe'en, Boston: Lothrop, Lee and Shepard Co., 1919, chapter 15, p.127. "Hallowe'en in America". ↑ Kelley, Ruth Edna. "Hallowe'en in America". ↑ For examples, see the websites Postcard & Greeting Card Museum: Halloween Gallery, Antique Hallowe'en Postcards, Vintage Halloween Postcards. ↑ Beauchemin, Genevieve; CTV.ca News Staff (31 May 2006). "UNICEF to end Halloween 'orange box' program". CTV. Retrieved 29 October 2006. ↑ Hollister, Helen (1917). "Halloween Frolics". Parlor Games for the Wise and Otherwise. Philadelphia: Penn Publishing Company. p. 98. ↑ "Vintage Halloween Cards". Vintage Holiday Crafts. Retrieved 28 October 2009. 1 2 Associated Press (30 October 2005). "Haunted house business getting frightfully hard". MSNBC.com. MSNBC. Retrieved 18 November 2008. ↑ Greg Ryan (17 September 2008). "A Model of Mayhem". Hudson Valley Magazine. Retrieved 6 October 2008. ↑ Wilson, Craig (12 October 2006). "Haunted houses get really scary". USAToday.com. ↑ Nixon, Robin (27 October 2010). "Poisoned Halloween Candy: Trick, Treat or Myth? – LiveScience". LiveScience.com. Retrieved 23 January 2011. ↑ "Here's to the Soulcakers going about their mysterious mummery". The Telegraph. Retrieved 6 November 2012. One that has grown over the past decade is the so-called Night of Light, on All Hallows’ Eve, October 31. It was invented in 2000, in leafy Chertsey, Surrey, when perhaps 1,000 people took part. Now it is a worldwide movement, popular in Africa and the United States. The heart of the Night of Light is an all-night vigil of prayer, but there is room for children’s fun too: sweets, perhaps a bonfire and dressing up as St George or St Lucy. The minimum gesture is to put a lighted candle in the window, which is in itself too exciting for some proponents of health and safety. The inventor of the Night of Light is Damian Stayne, the founder of a year-round religious community called Cor et Lumen Christi – heart and light of Christ. This new movement is Catholic, orthodox and charismatic – emphasising the work of the Holy Spirit. ↑ "Bishop Challenges Supermarkets to Lighten up Halloween". The Church of England. Retrieved 28 October 2009. Christianity needs to make clear its positive message for young people. It's high time we reclaimed the Christian aspects of Halloween," says the Bishop, explaining the background to his letter. ↑ "Halloween and All Saints Day". newadvent.org. n.d. Retrieved 22 October 2006. 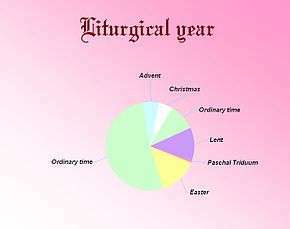 ↑ The Anglican Breviary. Frank Gavin Liturgical Foundation. 1955. pp. 1514 (E494). Retrieved 12 November 2015. ↑ Allen, Travis (2011). "Christians and Halloween". Church Publishing, Inc. Retrieved 31 October 2011. Other Christians will opt for Halloween alternatives called 'Harvest Festivals', 'Hallelujah Night' or 'Reformation Festivals'--the kids dress up as farmers, Bible characters, or Reformation heroes. ↑ Woods, Robert (2013). Evangelical Christians and Popular Culture. ABC-CLIO. p. 239. ISBN 9780313386541. Evangelicals have found opportunities with both Christmas and Easter to use Christian candy to re-inject religion into these traditionally Christian holidays and boldly reclaim them as their own. 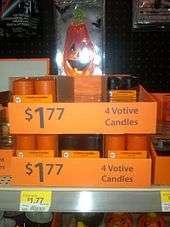 They have increasingly begun to use Halloween, the most candy-centric holiday, as an opportunity for evangelism. Contained in small packages featuring Bible verses, Scripture Candy's "Harvest Seeds"--candy corn in everything but name--are among many candies created for this purpose. ↑ D'Augostine, Lori. "Suffer Not the Trick-or-Treaters". CBN. Retrieved 23 October 2013. ↑ Gyles Brandreth, "The Devil is gaining ground" Sunday Telegraph (London), 11 March 2000. ↑ "Salem 'Saint Fest' restores Christian message to Halloween". www.rcab.org. n.d. Archived from the original on 29 September 2006. Retrieved 22 October 2006. ↑ "Feast of Samhain/Celtic New Year/Celebration of All Celtic Saints 1 November". All Saints Parish. n.d. Retrieved 22 November 2006. 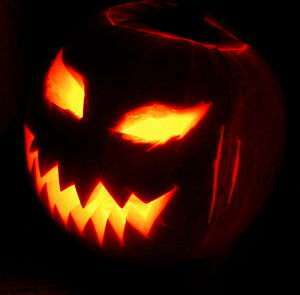 ↑ "Halloween's Christian Roots" AmericanCatholic.org. Retrieved on 24 October 2007. ↑ Suarez, Essdras (29 October 2007). "Some Christians use 'Hell Houses' to reach out on Halloween - USATODAY.com". USA Today. Retrieved 7 November 2015. While some Christians aren't certain what to make of Halloween -- unsure whether to embrace or ignore all the goblins and ghoulishness -- some evangelical churches use Oct. 31 as a day to evangelize. ...Some use trick-or-treating as an evangelistic opportunity, giving out Bible tracts with candy. ↑ "'Trick?' or 'Treat?' – Unmasking Halloween". The Restored Church of God. n.d. Retrieved 21 September 2007. ↑ "Jews and Halloween". Jewishvirtuallibrary.org. Retrieved 5 March 2013. 1 2 George, Stephanie (25 October 2010). "Real-life witches that don't celebrate Halloween". The Manitoban. Retrieved 29 May 2014. ↑ McCann, Chris (28 October 2010). "Halloween firework injuries are on the increase". Belfast Telegraph. Retrieved 22 November 2010. ↑ "Kalan -Goañv ha Marv". Tartanplace.com. 12 July 2001. Retrieved 1 November 2012. ↑ Paul Kent (27 October 2010). "Calls for Halloween holiday in Australia". The Herald Sun. Retrieved 7 October 2013. ↑ Denton, Hannah (30 October 2010). "Safe treats for kids on year's scariest night". New Zealand Herald. Retrieved 22 November 2010. ↑ Trinidad, Karen. "Tagalog festivals - Araw ng Patay". The government of Camarines Sur. Retrieved 30 October 2013.